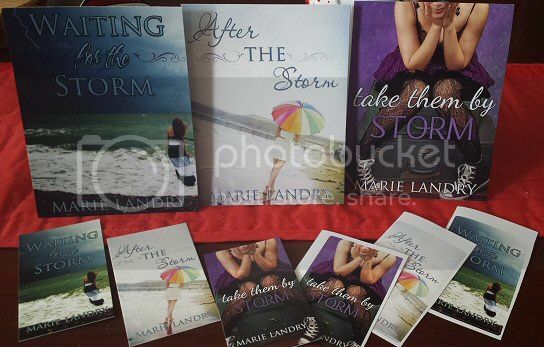 Ramblings of a Daydreamer: TAKE THEM BY STORM is out! TAKE THEM BY STORM is out! When I started writing Waiting for the Storm, I had no idea these characters would stick with me so much that I'd end up writing three books in the Angel Island 'universe'. Charlotte, Ella, and Sadie have become a big part of my life over the last couple years, and I'm so excited their stories have come full circle. Sadie came out of nowhere when I started writing After the Storm. She started off as a character I thought would make a few brief appearances, and then all of a sudden she was talking to me as much as Ella was. She demanded to be a big part of the story, and she was. She was exactly what Ella needed, and as she revealed bits of herself to me (there were at least three big things about her that popped up with no warning), I knew she was something special. I'm not sure when exactly I knew she'd get her own story, but when After the Storm came out and people started telling me Sadie was their favourite character, I knew I had to write her book. This was one of the easiest, and yet one of the hardest books I've ever written. Writing a side character who's a lesbian is a lot different than writing a main character who's a lesbian. I had a lot of doubts going in. What if people wouldn't read it because it was LGBT? What if people questioned me about my own sexuality? What if I got hate mail from homophobes? What if I couldn't do this story justice? What if people didn't like it because it's an unconventional love story (I can't explain that one because of spoilers)? Then I realized telling this story was worth getting past those doubts and fears. If people don't read it because it's LGBT, I think that's their loss. People who say they 'can't relate to LGBT characters' boggle my mind. Do you not relate to human emotion? To grief and joy and pain and love and adventure and new experiences? As for people asking about my sexuality...they can ask, but it doesn't mean I have to answer, considering it's nobody's business, right? ;-) I'm not one of those people who leads with their sexual orientation, mostly because I don't feel like it defines me. Once I got over all those fears, I had so much fun writing Sadie's book. I pulled from my own college experiences, which made me nostalgic, but it was also cathartic in a way to go back to that time, get out old pictures, and add in little inside jokes that only my college friends would get. If they ever read this book, they would likely see a lot of themselves (and me) in some of these characters. Sadie makes mistakes, she learns a lot, she falls in love, she discovers new things about herself, all while staying true to herself and being proud of who she is. Want to win a $10 Amazon gift card? YA Bound Book Tours is hosting a week-long book blitz for Take Them by Storm from the 5th - 12th, and I'm giving away a gift card! You can find the giveaway on YA Bound Book Tours, or included in any of the participating bloggers' posts. Want to win a set of Angel Island swag (postcards, mini bookmarks, and stickers)? You can enter that giveaway here! Watch my Twitter, too, because I'll be doing giveaways there! Congrats on the new book! I love the cover and the title.